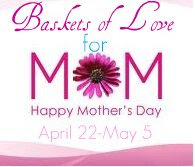 Baskets of Love for Mom Giveaway Event grand prize is $200 Amazon.com Gift Card, a Bea’s Gift Baskets and Gifts Gift Basket (up to $50)! This great event is hosted by Bea’s Gift Baskets, Mommy’s Memorandum and Clipping Money and sponsored by some amazing blogs! It’s a GREAT gift for your Mom, your Grandmother – OR – hey, we won’t judge if you just want to win it for yourself ! Good luck to all and Happy Mother’s Day! The fun doesn’t stop here. Bea’s Gift Baskets and Gifts is also sponsoring TWO awesome parties to kick off this event, with the opportunity to win more great baskets! This event will end May 6th at 12:01am. To enter use the rafflecopter form below. Disclosure: This giveaway is a self-sponsored group collaborative effort in order to provide a cash prize. Each participant has provided funds in order to present this giveaway. This event is in no way sponsored or affiliated with any company or other individual(s) other than those included within the Rafflecopter widget. « Win a 2 Night Vacation Getaway Giveaway – LA, Las Vegas, & More! Feeling lucky today 😉 Just recovering from a horrible cold/flu, and would love to win! Thanks so much for all the amazing giveaways! Would love to give this to mom! I am great! Thanks for asking! I am doing just great. I am doing great today. I’m doing the same as every other day. I’m doing pretty good today. Thanks for asking. I feel fabulous today and hope everyone celebrates Earth Day year round! just got back from a business trip but doing pretty well now that I got a good night sleep in my own bed! I am having a great day! I’m doing alright. Woke up not feeling great, but feel better now. Just tired. Glad it’s the weekend. Crazy Monday, but doing ok! Not bad for a Monday! Would be pretty cool to win this. i dont have a twitter acct;and i don’t tweet,the weather here is very cold,wind could get up to 45mph,a good day to stay@home!doing good trying to win something,as usual,hope your’re doing good,thanks for the giveaway! Well fantastic actually! About 10 days ago my 28 year old Daughter came down with the flu, her 3 kids all got sick as well as her hubby, she was so busy taking care of those babies that she forgot to care for herself, well, she ended up with Pneumonia in BOTH lungs, we kept telling her to go to the Dr this was before she got really sick, anyways, she got so bad she could not walk and I noticed her feet and fingers looked odd like turning purplish color, we got in in the car and went to the ER, they took her right back, and not even 10 mins later they kicked us out of her room and called a code, her vitals so so bad, they incubated her and rushed her up to ICU, she had they discovered something called Sepsis, the bacteria from her lung infection went into her blood, this is serious and is fatal, they told us she had less than a 5% chance at survival, we were ALL in shock, no one, not even her, knew she was THAT sick, they exhausted everything they could do for her and told us she was going to die and probably would not live past that evening, one of the Dr’s said he called a different hospital, they have a brand new procedure called Ecmo, it’s a machine that takes all your blood out of your body and replaces it with good oxygenated blood, she was in septic shock when they got there, they came with this huge rolling hospital on wheels is what I called it, they had to do this is 3 stages, stage one in her rotating bed then 2nd was in 2nd floor OR, then they got her into that big ambulance and took her over the bridge into Portland Oregon, and there is where they finished stage 3 of placing all the huge tubes throughout her body, Me her sister and her hubby all lived in that family waiting room for days while she was fighting for her life, she was in an induced coma and all we could do is wait and Pray that all her failed organs would heal from this Sepsis, well yesterday they did a trach, and now we can at least see her face without all those tubes, and she opened her eyes for a moment, she is moving her hands and feet and when the Dr and nurses ask her to do something like stick out her tongue she does it! This is awesome! no brain damage and shes off the Ecmo now too! They had told us that all of the blood from her limbs went to her organs when they started shutting down, so this is why I saw that color in her feet, well they both turned black and so did all her fingers and her left arm from the elbow down, all those they said she would lose, not anymore! all the circulation is back! and shes only going to lose one of her big toes! God is Good and He pulled her through this plus shes a fighter! sorry I know this is long, but I’m on cloud nine right now, my Daughter is alive! and coming home eventually to take care of those babies! I would take HER on a trip! after all this? heck yes I would lol Hug your loved ones and tell them everyday you love them, tomorrow is not promised, I know when I can I am huggin her and I won’t wanna let go! lol This story has much more to it, but if I sat here and said it all this post would be way to long. Ty for reading my ramblings, I’m just so Grateful to God right now. God is so good ALL THE TIME!!! God Bless You and Your family!! I’m pretty good. 🙂 I have a break day for once so I’m spending it relaxing and reading. I am having a great day, despite the chilly rain 🙂 Thanks for the giveaway! After a 12 hour shift I am enjoying a morning entering contests and taking care of my 2 Grandaughters.The neighbors house burnt yesterday and I am grateful they all were safe. I am loving my day. Sunshine and 90 degree weather…couldn’t get more perfect than that. I had a pretty good day. It was under 100 degrees and I got in my workout. I am doing just great today! The sun is out and I’m loving it! Doing great! All is well & I have no complaints!! I am having a MISERABLE day today! My five year old got my 15 month old’s syringe that we use when we give him tylenol, and he filled it up with chocolate milk and shot it all over our walls and ceilings, in the TV speakers, on a couple of really nice paintings that we have, our pictures on the wall, the piano, the train set and a large clock on the wall and then left it there and didn’t tell me until I started to discover it a bit at a time this morning! Needless to say, I’m pissed! It’s no small amount of milk either! I’m going to have to move all of the furniture, clean all of the walls, clean the entire ceiling, move the piano and television and clean behind them, get my paintings fixed/replaced, clean all of the picture frames by hand as well as the windows, and most likely, I will need to wash my curtains too…and clean my couch with our carpet cleaner! GRRRRRR! Hope your day is better than mine! Im doing great today , thanks for asking. Recovering from back and spine surgery, so doing as good as I can. we are doing great today! today is my birthday, my mom cooked me dinner of chili reanios (sp?) and then i got to spend time with my beautiful nephew jaxson! great day!! I’m feeling just fine today. I am happy, got a 98 on my micro practical! I’m doing great – it’s Friday and my hockey team starts their second round of the playoffs tonight! I am doing OK how about you? I have my computer and my Kindles and I have entered a few sweeps and emailed some friends. I love all of the new technology. i am doing great today and hope that it will continue. How about you? Today, I am very tired from being up all night with allergies and a cold. I love the spring, but the pollen levels in my area are horrendous. I’m having a really nice day! I would love to give this to my mom. She is hardworking. Always thinking of others. Plus never has money of her own. My Dad controls it. I’m doing well. It’s the 1st of May & we have rain & it’s in the 40’s today here in New England. I am doing ok for a Tuesday workday. I’m doing well today because I took my Dad out for his 71st birthday lunch! I’m doing well 🙂 Loving the nice weather! Doing great how about yourself? It’s still early so who knows what the day will bring but so far, I am doing great! Got a porcupine underneath our summer porch- have no idea how to get our friend to leave- afraid my cats may get hurt. Today was a WONDERFUL day! I got a hug and a kiss from all of my kids. My oldest 2 said they love me, my youngest doesn’t speak that well yet, but he cuddled and said “love”, which is definitely good enough for me. My wonderful husband texted me funny pictures all day while he was at work. He also picked up supper so I didn’t have to cook tonight. I spoke to both of my parents today. So, even with their health being bad, I know they’re both doing well 🙂 Yes, I have to say, today was GREAT! Today’s I’m doing great, counting down the hours til the weekend! Doing great… Just a little tired. I’m feeling fine but if I win I’ll feel outstanding. Feeling pretty darn wonderful today. Having a wonderful day today! Thankyou for a great giveaway. Am doing great today – after all, it’s Friday and almost the end of my college’s Spring semester! One more week to go – woo-hoo! I’m so glad it’s Friday! Im great, as soon as my tv show comes on Im going to watch it and go to bed. My son is sick today 🙁 But other than that I’m doing great! Doing better now that I found this awesome contest! Today is just beautiful. Thanks for offering this giveaway – I would love to make Mother’s Day great for my mom this year. Today has been a very nice day for me. i doing alright toady thanks for asking!! Fine, I should be out cleaning the garage!! Hoping to win this great contest! I’m doing pretty good today. I’m home with my family. Just enjoying the time together kicking back. I am doing very well. Thank you for asking! I am doing great! Thank you for the giveaway!! I <3 your blog!! Today, I am good! No work! Wow!!! after reading Janene Scarborough story, I hope she wins! I am not even gonna enter this one Good luck Janene and I am glad your daughter is gonna be okay! I cannot even imagine my life without my daughter! It’s the weekend and I’m okay. I have a headache and I’m tired, but I’m hanging with my boys and going to see Avengers later today!! For the first time in weeks ,I am feeling great today! Well it is early in the morning so I am Very sore. But I am hoping for a good day. This mom is tired and a little stressed today. I really love Bea’s Baskets. This I would like for myself. My mom is not here anymore because it would go to her of course. Thank you for this giveaway!!! I’m OK today, raining out just cozy inside. I’m doing great today. It’s my birthday! I am feeling kind of depressed. My Cornea failed and I had to have another eye procedure before they can try another transplant. I can’t do much and I worry My sight won’t come back. I am doing fantastic today, I get to spend all day with my son. Thanks for the giveaway…going to a KY Derby party, so it will be a fun day ! It’s a great day to be alive! As we say here, it’s just another perfect day in paradise. Relaxed with some friends on the beach. I’m happy and content today. My day is quiet. kids are out with friends and just relaxing. I’m doing good~ A bit tired – had to work part of the day, but now home and relaxing! I did a lot of work around the house today and now I’m tired. Thank you for the giveaway!